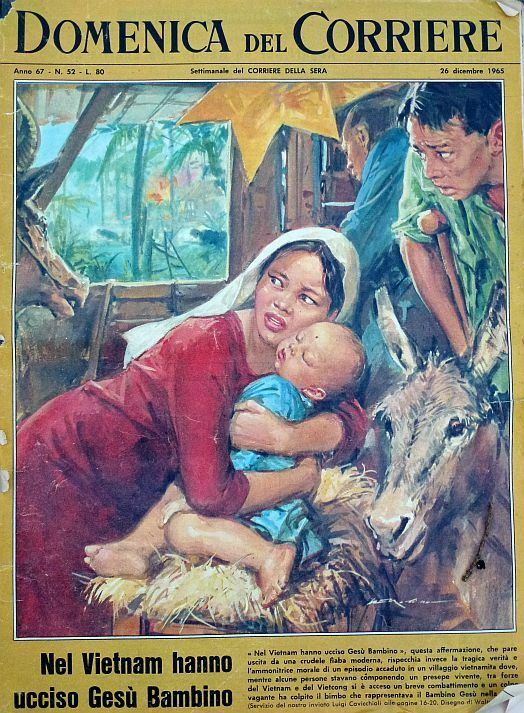 ‘In Vietnam they killed the Child Jesus.’ This phrase does not come from a cruel modern fable, but reflects instead the tragic truth and cautionary moral of a real event that took place in a Vietnamese village, where, whilst a group of people enacted a nativity scene, a brief battle ensued between Vietnam and Viet Cong troops, and a stray bullet hit the infant who stood for the Child Jesus in the crib. So what is this then? Is he only going to write about old Italian magazines from now on? No. But last post’s exercise wouldn’t be complete if we didn’t take a second sample. For what does it mean to say that fascism operated as a cultural logic in the texts that it produced, to the point of making the words of the great artist virtually indistinguishable from those of the great butcher, if we cannot trace in the texts subsequent to the fall of the regimes the absence or reversal of this logic? Another way to consider this proposition is through a thought experiment. Suppose you picked up a random magazine – for the purposes of this post, La Domenica del Corriere of 26 December 1965 – from a second-hand book stall or in a shop: how could you tell if it belongs to our time continuum, in which Mussolini was deposed and Italian Fascism officially ended in 1943, instead of an alternate universe in which the regime either won or managed by some means to survive the war? What kind of evidence would you look for? How difficult would you expect the exercise to be? It turns out to be not very difficult at all, on a level. It’s right there in the date: 26 December 1965. Not 26 December 1965-XLIII, which is how it would be written if this were still the Fascist Era, by now in its forty-third year. So we can at least posit some sort of discontinuity. But the easy ride ends here. There is almost nothing in the remaining 63 large-format pages of this – the foremost mainstream weekly magazine in the country at the time – to allow us to conclusively say that the Fascist regime was over at the time it went to print. A mention in a letter to the editor on page 2 of the opinion expressed in an earlier issue by a ‘Socialist MP’ (Mussolini had got rid of those), and some words of censure for the situation in Rhodesia (where, by unilaterally declaring the nation’s independence, Ian Smith ‘imposed the will of 260,000 whites over that of 3.6 million negroes’), are the closest thing to actual positive evidence. But otherwise, and even as it looks back on the key events of the year 1965, La Domenica fails to directly mention a single aspect of the country’s democratic system of government or, more importantly, articulate values greatly at odds with those of Fascism. In the coverage of new consumer technologies (chief amongst them colour television), the musical scene, cinema, sports and recreation, travel, fashion or money matters, La Domenica is studiously conformist and positively exudes bourgeois respectability, nowhere more so than in the piece on Marco Bellocchio’s debut feature, I pugni in tasca, praised as a dramatic spectacle and not, as other film writers would have it, for its elements of social critique. 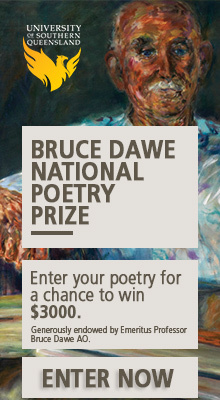 Saying at once: what critique? And a critique of what? There is nothing to critique, no such thing as bourgeois society. And then there are the things that would make you almost swear Fascism were still around. Indro Montanelli, who worked for Il Corriere during the war, commands the prime, full-page column spot on page 5. Perhaps most spookily, all of the products advertised are either Italian or German, as if the country were still under embargo. And there is the ad on page 2, above, for a series of special issues of the magazine celebrating Italy’s imperialist wars in Africa. 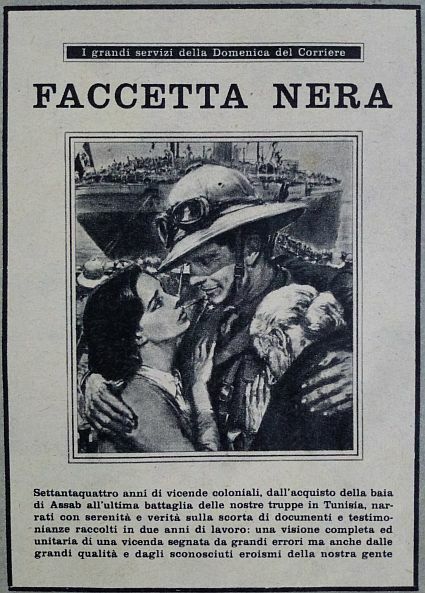 Faccetta Nera, was the title of the series. ‘Pretty black-faced girl’, after the title of the lively song that the Fascist sang as they took the country they called Abyssinia. Then, the blurb: ‘A history marked by great errors but also the qualities and the quiet acts of heroism of our people’. This, as late as 1965, is what remained of the aggression and the genocide, of the massive use of mustard gas during the counter-offensive in Ethiopia, of the concentration camps. Errors, perhaps, some of them – not crimes, no – but more than made up for by the quiet heroism of our people. 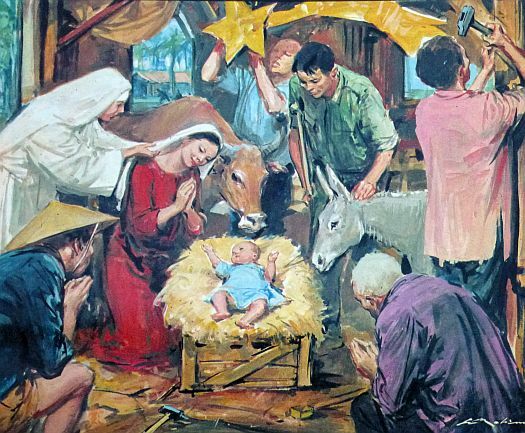 No, he wasn’t a Vietnamese child, or rather, he was, he had the little face of a young Vietnamese child, but he was the Child Jesus… no, it isn’t an expression… he really was the Child Jesus. Not one of theirs, one of ours: made white, Christian, properly human by a symbolic arrangement of bodies inside a makeshift manger. Mr Cavicchioli proceeds to turn the story from jungle legend to reality. He supplies all the requisite detail. He even writes the scene of the death: amidst the commotion and the sounds of gunshots a little red dot appears on the baby’s forehead, a little red flower whose stem soon grows to reach the baby’s feet, and the mother thinks he’s sleeping, but then when she realisation dawns on her she slumps with a wail near the crib (‘at that moment she was the Virgin Mary holding on to the Cross’). I could swear at this point that Italy was never liberated, that this kind of story couldn’t possibly be the product of a society other than the one that proudly sang Faccetta nera and civilised the savages with muskets, missionaries and mustard gas. And still I look for signs of what has changed. Clichés turn on their heads on the head of a pin here – the past is a foreign country; truth is stranger than fiction etc. With the upshot of this sort of reading I wouldn’t be unhappy should you continue to write about old Italian magazines. I’m with Dennis – keep writing about the old magazines. You people don’t know what you’re getting yourselves into! But doesn’t the distinctiveness of fascism lie less in how it manifests one in power (at which point it becomes very similar to other forms of right-wing dictatorship, such as those that prevailed in Latin America) and more in the way that it arises, the specific kind of mass mobilisation it represents against the Left? If that’s the case, I guess I’m wondering how you’d expect a magazine of the period to differ (culturally, at least) from that of the post-fascist period. It seems to me quite an important point because, as you’ve raised earlier, the Left has a tradition of describing everything as ‘fascist’, to the point where, now we need the descriptor, it’s been rendered well-nigh meaningless. For me, I would look for the signature traits of fascism in the movement on the rise rather than as a regime. I’d be interested to know what you think about that. Can you actually identify a ‘fascist culture’ from that period and, if you can, can you read back from it in such a way to tell you anything meaningful about what new fascist movements might look like? I agree with much of what you say. To the extent that the word “fascist” gets overused, it is precisely that those who use it frequently overlook the very specific ways in which fascism seizes and then exercises power, in the absence of which you simply cannot say “this is fascism” or “this is like fascism”. However in the countries that have historically embraced fascism the burden of proof is shifted. In these countries I think we should also look for the particular ways in which fascism was repudiated, and at the extent that their societies have inoculated themselves against its resurgence. Now Italy both had an amnesty (in 1946) and left in place the near totality of the administrative institutions set up by the regime, often with the same people in charge. It did so because it thought that writing into the constitution the repudiation of Fascism was enough to cleanse those institutions and rehabilitate those criminals. And this thinking swiftly become implicit, its assumptions untested. After an initial period of almost theatrical de-fascistisation – notably through the flurry a neorealist films in the years immediately following the war – a very weak and equivocal anti-fascism became our default cultural attitude. I think this magazine is a manifestation of that attitude, and not just for how it black-washes the Fascist colonial wars, but also because there are simply no signs in it of a more robust set of democratic, anti-fascist values and institutions. This matters because it segues directly in what happened in the last twenty years, when parties that explicitly acknowledged the intellectual and political heritage of Fascism were returned to power. I guess I had in mind Germany where, in response to the mainstream insistence that the Nazi era was an almost inexplicable manifestation of collective madness, some on the Left insisted that fascism had never gone, that the persistence of Nazi-era authority figures meant that post-war Germany was more-or-less a continuation of the Third Reich. That’s obviously silly. But at the same time, I can see the point you’re making, the importance, in countries where fascism took power, of noting continuations. I will have to think about this more.